On Site: “Spaces” Hofer/Struth, Clark Institute, Williamstown, Mass. When it comes to fine art photography, these days “bigger is better” … or so they say. The fact that color lends a different dimension to these larger works is an interesting thought in itself. Could Black and White compete at this scale? At the beautiful Clark Museum you can judge for yourself with the wall size photos of Candida Hofer and Thomas Struth. The large-scale photographs by Candida Höfer and Thomas Struth featured in this exhibition offer distinct but connected perspectives on the ways individuals interact with the spaces they inhabit. Trained together at the Kunstakademie (Arts Academy) Düsseldorf in Germany in the 1970s, Höfer and Struth have embraced photography as a medium of social, cultural, and historical purpose, choosing public spaces as their subjects. Both Höfer and Struth engage with history and the passage of time. Höfer’s photographs of libraries, auditoriums, and research centers are mostly uninhabited by people but filled with light and the mystery of visual and intellectual contemplation. Although the architecture of these monumental rooms conforms to a symmetrical logic, the photographs are pervaded by a sense of loss as the use and significance of the spaces have shifted over time. 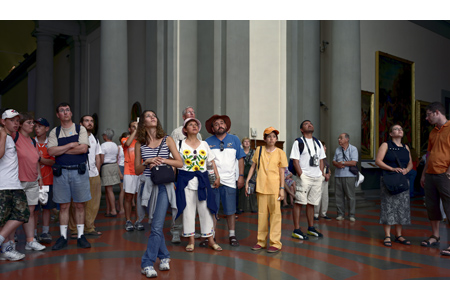 Struth’s works capture church and museum visitors engaged in the act of looking, as we, the viewers of the photographs, observe them from a physical and temporal distance. This reflexive impulse allows us to experience several historical moments at once, both inside and outside of the picture’s frame.